DALLAS — New research from Parks Associates reveals 35% of smart home owners (8% of U.S. broadband households) use a smart home hub or app to control their smart home devices as part of an ecosystem, with smart speakers as the most prevalent controller. 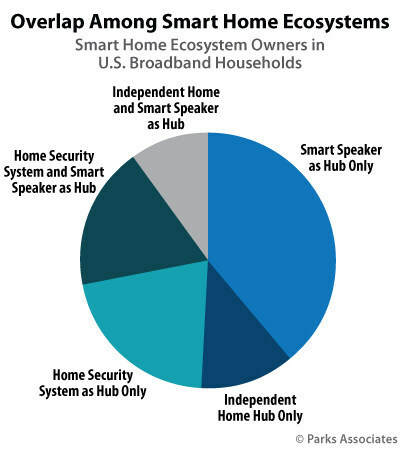 ‘360 Deep Dive: Smart Home Ecosystems: Driving the Smart Home Forward’ reports 5% of U.S. broadband households use their smart speaker with voice assistant as a hub, compared to 3% who use a home security system and 2% who use an independent home control hub. Voice platforms are important among smart home device owners who are planning to buy more devices in the next 12 months. ‘360 Deep Dive: Smart Home Ecosystems: Driving the Smart Home Forward’ finds that only about one-third of all smart home intenders plan to use a voice method to control the devices they buy, but among households that already have devices and a hub, a substantial portion plan to use voice as a primary method of controlling their planned purchases. ‘360 Deep Dive: Smart Home Ecosystems: Driving the Smart Home Forward’ offers insight into which households value which hub types as well as how they use them in order for industry players to improve user interfaces and develop strategies for compatibility across smart home devices.